Refresh Rainshower with InvigoRain/Immersion and 7-Function Hand Shower in Brushed Nickel Refresh showering collection offers a wide variety of styles and functionality, providing multiple options to personalize your shower. A completely refreshing product line. Innovative design, exceptional beauty and uncomplicated style features give the Refresh collection an ageless yet fashion-forward presence. Tailored yet relaxed, the Refresh collection is an exercise in design balance. This lustrous collection works seamlessly with today's lifestyles. Refresh Rainshower with InvigoRain/Immersion and 7-Function Hand Shower in Brushed Nickel is rated 5.0 out of 5 by 2. Rated 5 out of 5 by Canada1425 from Excellent showerhead Installed last year and am extremely happy with it. After about a year, I noticed a lot of spray coming from base of fixture and was worried it had come to the end of its use, but took the fixture off and re-set the gasket inside (and applied thread sealant to prevent it from happening again) - back to excellent working order. 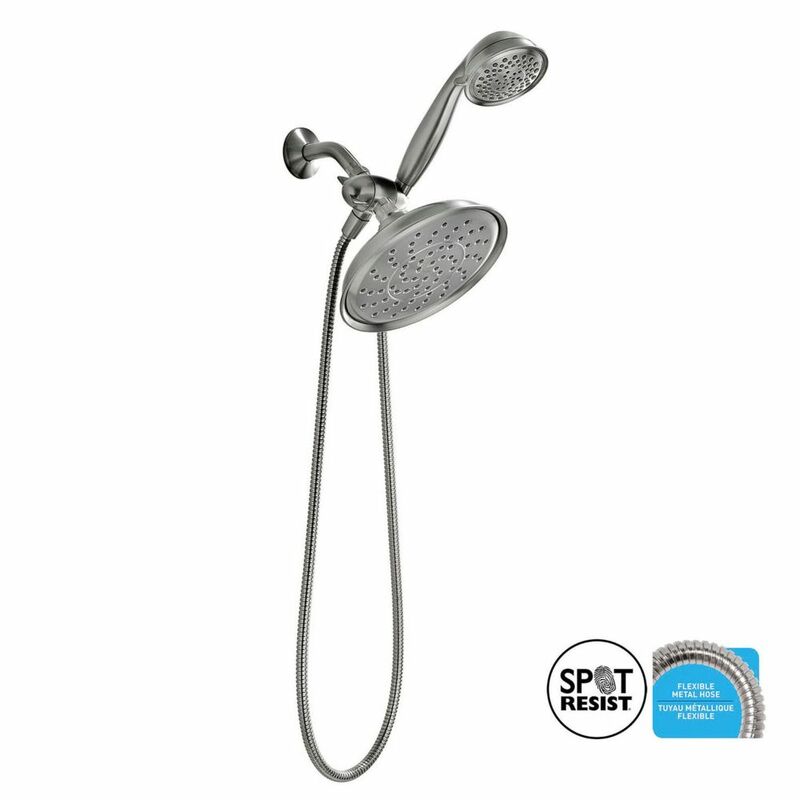 Rated 5 out of 5 by Madeline from Excellent Quality I absolutely love this shower head. It has 2 heights, lots of pressure, you can use 1 or both heads. Fantastic product. High quality. Would love to buy a second one if it came in a dark colour. Does the stationary shower head work independently of the handheld shower piece? Is this showerhead compatible with a Moen #3330, three function moentrol/diverter valve? Thank you so much for your interest in Moen products. The 25510SRN refresh product is compatible with the 3330. If you have additional questions, please complete the form at http://www.moen.ca/consumer-support/contact-us or call Moen at 1-800-465-6130. Our business hours are 7:30 a.m. - 7:00 p.m. Monday through Friday EST. Roughed into our tub showers is a Moen Posi-Temp valve, is this Refresh Rainshower with InvigroRain/Immersion &amp; 7F Handheld shower head COMPATIBLE with the Moen Posi-Temp Valve? Thank you so much for your interest in Moen products. The 25510SRN refresh product is compatible with the Posi-Temp valve. If you have additional questions, please complete the form at http://www.moen.ca/consumer-support/contact-us or call Moen at 1-800-465-6130. Our business hours are 7:30 a.m. - 7:00 p.m. Monday through Friday EST.